COLUMBIA, S.C. -- Hundreds of people from opposing groups taunted each other on the grounds of the South Carolina Statehouse on Saturday. Black Educators for Justice, based in Jacksonville, Florida, held its rally Saturday on the north side of the Statehouse, where the Confederate flag was removed earlier this month. Later, the North Carolina-based Loyal White Knights of the Ku Klux Klan held a rally on the opposite side of the building to protest the flag's removal. 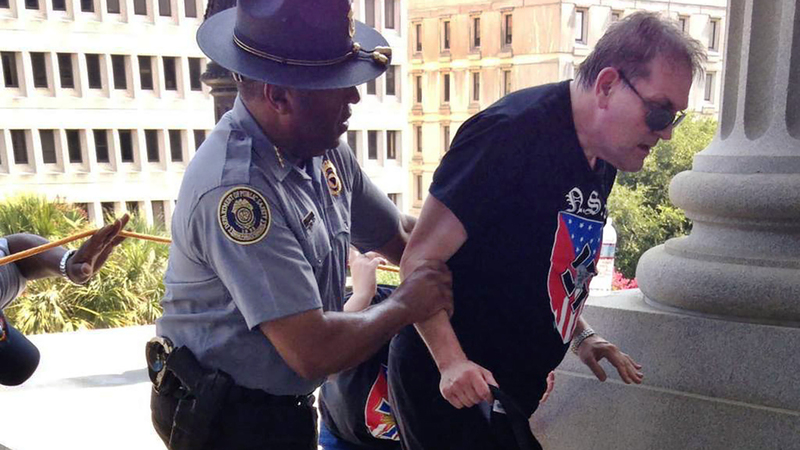 From the heated rallies emerged a photo of a black police officer helping an elderly man, who was wearing a National Socialist movement T-shirt, out of the heat. The photo quickly went viral. Photographer Rob Godfry was there to capture the moment the KKK supporter was helped out of the heat by officer Leroy Smith. Gov. Nikki Haley earlier in the week urged residents to avoid the KKK rally, adding that doing so would honor the nine people shot and killed at a predominantly black church in Charleston last month.